How high should you pull your foot up when running and with how much effort? To know the answer to this question, one has to understand the purpose of the action of pulling your foot up when running. This is where the importance of understanding the ‘why’ is highlighted again. Reading the theory and understanding it through and through is not about complicating what most of us wish was such a natural form of locomotion – running. Contrary to that common assumption and in my opinion, gaining full understanding of the subject is actually about gaining freedom. Freedom to effortlessly do what needs to be done because you know exactly what is happening, you know the rules and you can work with them at any speed on any terrain. To put it simply, the necessary height of the pull will sort itself out. You do not need to think about it, all you need to do is make a slight effort to pull your foot up high enough to clear the ground and so it allows for change of support because running is nothing but ‘change of support’ while falling forward. In the Pose Method of Running, the pull is the last element of the technique that allows for the most efficient transition from one foot to the other. All you need is to execute the action of pulling correctly – everything else will be done for you. Trust the natural forces. Effortless running is achieved through biomechanically proper technique because such technique works with and uses the natural forces such as gravity. By its definition effortless running requires less effort. So, if all we need to do is change support in order to run, then the ultimate goal is to do that action with the least possible effort. Narrowing down all required action to a single action of pulling in the Pose Method of Running gets us closer to running with less effort, and actively working just one group of muscles – the hamstrings – fits the purpose and serves it well. You will notice that putting less intentional effort into pulling your feet up by utilizing the hamstrings only will help you do it correctly. You will also notice that such an important thing as high cadence is easier to achieve, if you don’t strain to pull your feet all the way up. The general rule is – you’re better off pulling your foot up less than more. If you pull too high and too hard you will waste energy and will tire your hamstrings and might get injured. Keep in mind, that the exaggerated motion of the pull, demonstrated in the running drills, is strictly for learning purposes, to help your body learn better patterns of movement required for running. What about other muscles? Leave them alone. All you need is to do one action – pulling your foot with your hamstrings – to set everything in the right motion with minimal effort. 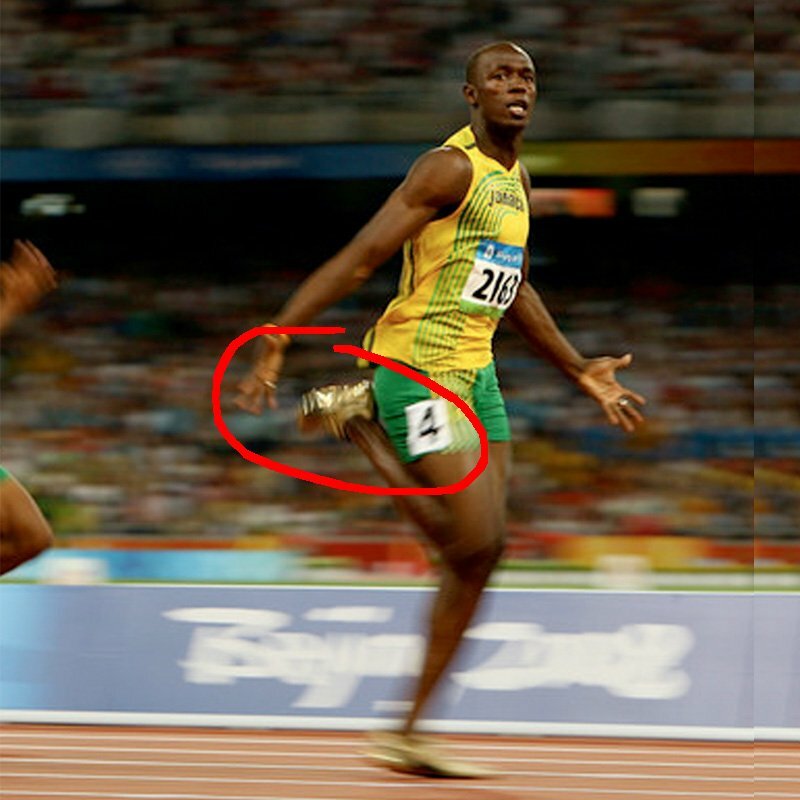 When you run faster, your foot will end up higher. I say ‘end up’ because you are not supposed to be putting any effort into pulling it higher or leaving it lower. That’s too much to think about especially in sprinting where everything happens way before you can think about it. If you’re thinking about it, you are already too late. This is happening on its own and due to the forces already in play, Bolt is NOT PUTTING EFFORT INTO PULLING his foot up this high. There is no need to put any effort into forcing your foot so high. The entire trajectory of your foot will determine itself based on your speed. All you have to do is focus on maintaining your running pose. At a slower speed your feet will be noticeably and naturally lower. When jogging, your running might resemble shuffling. Your feet will be at their lowest height of the pull.